This includes software used to capture regulatory rules (legal information is provided via aosphere and rules are created and managed by our dedicated rule team). However, this is not the end of the story. There is an underestimated component associated with true automation and it applies whether you manage shareholding disclosure using Rapptr or using an inhouse system. In short, keeping on-top of constantly changing regulatory data is a significant task. My job is to source and interpret regulatory data, transforming unstructured text into a machine readable format. Some sources are simple. For example, the nice people at the UK Takeover Panel provide an XML file which is pretty much perfect. Unfortunately, most regulatory pages are much more difficult to scrape. One of our favourites is the HK Takeovers & Mergers list! The nature of real-world data is that it regularly changes, and is rarely perfectly formatted, so, on one hand you want to be fairly permissive, but on the other hand you don't want to be reading garbage if the structure gets completely changed. Given that we're going to be using this information for very important purposes, we make the scrapers confirm that they have 100% confidence in their source. This is the art of writing a good scraper. We apply this process with all the words from both the table and the spreadsheets, then use the results to find matches. URLs change, web-servers can be unresponsive or can go down completely so FundApps’ scraping processes have to be so robust that they can reschedule themselves to check the website again in a few minutes or to look around until they’ve found the data they expect. Our automated scrapers run every two hours, examining the Hong Kong Takeover List and a dozen other lists (new lists are constantly being added). With everything fully automated there is no room for “missing” a takeover or copying and pasting the wrong ISIN. Now that’s what we call automation! 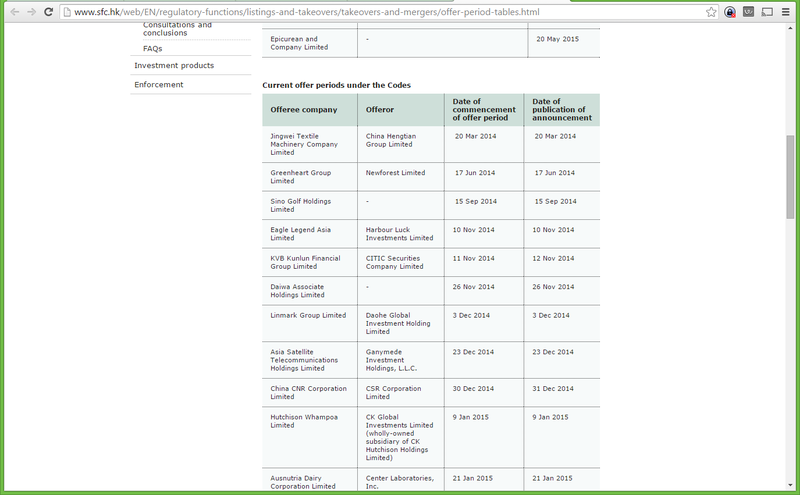 Take a look at our automated Shareholding Disclosure service to find our more, or contact us to arrange a demo.